Jones’ UFC showdown with Alexander Gustafsson on 29 December has been moved to Los Angeles. Jon Jones tested positive for turinabol in 2017. UFC 232 WILL be moved from Las Vegas to LA due to licensing issue involving Jon Jones in the state of Nevada, president Dana White revealed. A trace amount of the banned substance turinabol was discovered in a drug test administered to Jones (22-1) – who is scheduled to face Alexander Gustafsson (18-4) on Saturday – on 9 December. The showdown has now been relocated from T-Mobile Arena to The Forum in Inglewood, California. White told ESPN’s SportsCenter: “Nevada does not have the time to see us and go through a hearing to find out what California already knows. White added: “If these guys even doubted that something bad happened here and he was wrong or whatever, the fight’s off. We’d pull the fight. 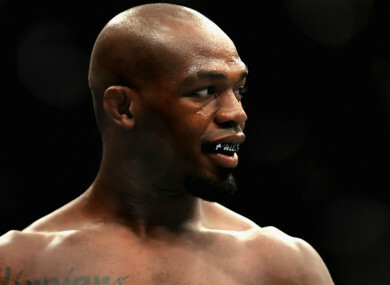 UFC vice-president of Athlete Health and Performance Jeff Novitzky told USA Today that Jones had not violated the anti-doping program. “He’s been cleared to fight in terms of the USADA program. … USADA fully analysed it internally,” Novitzky said. “They reached out to outside experts from around the world. They reached out to another sports league that has seen the same issue. Email “UFC 232 relocated from Las Vegas to LA due to Jon Jones' test results”. Feedback on “UFC 232 relocated from Las Vegas to LA due to Jon Jones' test results”.